The ancient political maxim “divide and conquer” (Lat. “dīvide et īmpera”) has been used for millennia in politics, sociology, and psychology, mainly to manipulate people. In the last two centuries, however, this principle has also been adopted by computer science. It is widely used in computer programming, primarily in computer algorithms such as binary search, quick sort, Fast Fourier Transform (FFT), parallel processing algorithms – to name a few. Combine – aggregate the results of the solved sub-problems to deduce the result of the initial problem. However, in this blog post we’ll reverse the “divide and conquer” principle and go backwards from step three to step two, to combine and then conquer. In our day-to-day programming activities, we may not need to divide a problem in order to solve it. In many cases, we deal with small pieces of a puzzle (language elements) provided by the SAS programming language, and we solve some larger problems by combining those elements. In other words, you need to display percentages that are greater than 10% as whole numbers, percentages between 1% and 10% as numbers with one decimal point, and percentages that are less than 1% as numbers with two decimal points. You may get away with proc format’s picture statement with a proper multiplier – but good luck with that. Fortunately, there is a much better way of solving this problem. Did you know that you can use already existing formats as labels in proc format’s value statement? In other words, we can combine several SAS formats while defining another SAS format. When using an existing format as a label, make sure to enclose the format name with dot in square brackets, e.g. [date9. 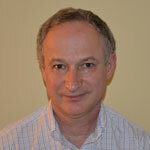 ], and do not enclose the name of the existing format in single or double quotes. Using an existing format in the format definition can be construed as format nesting. 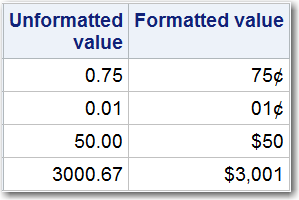 A nested level of one means that you are creating the format A with the format B as a formatted value. 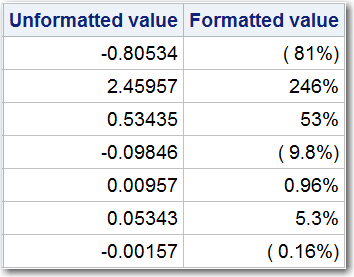 However, if you also create format B with the format C as a formatted value, then you have nested level of two. Avoid nesting formats with a level higher than one, as the resource requirements may increase dramatically with each additional level. 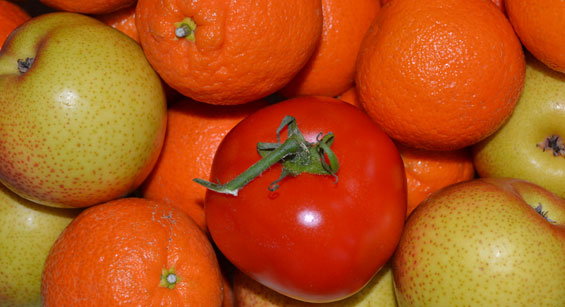 Yes, you can combine apples with oranges, and even with tomatoes, and that will enable you to access the SAS data sets in several libraries with one libref. It is important to know that while SAS has no problem combining multiple libraries that contain same-named files, when you reference such a file, the concatenated libraries are searched in order and the first occurrence of the specified file is used. Then when you reference your table as lastlib.SALES SAS will return the SALES table from production environment if it exists there; if not then from testing environment if it exists there; if not then from development environment it exists there. That logical hierarchy means that SAS will return the latest and greatest version of that SALES table. If you want that table from a specific environment, then you reference it using a specific libref: prodlib.SALES, testlib.SALES, or devllib.SALES. This implies that your SAS formats are stored in the catalogs named FORMATS in the above specified libraries: prodlib.FORMATS, testlib.FORMATS, devllib.FORMATS. If WORK and LIBRARY libraries are specified in the fmtsearch= then the default is not applied and the search order is as specified. An unlimited space below is reserved for your contribution to the fascinating topic of combine and conquer with SAS. This is your chance to contribute to the list of coding techniques that you use to combine and conquer solving your SAS coding problems. The agile approach! Love it. Thank you, Matt. I did not think of it as "agile", but you are correct - combining data libraries and format libraries allow us to automate incremental SAS applications development, which is the definition of agile software development. If you're running out of space in your SASWORK directory and have other directories or mount points to put work files and don't want to ask you System Administrator for help then try combining multiple work directories in your saswork option. 3. In your sasv9_usermods.cfg file refer work to the text file created above. Thank you Jerry, for your contribution to the "combine and conquer" cause. Combining system resources is like a teamwork - increases capacity and reduces stress on its "components". As for tomato being a fruit, I would combine it with apples and oranges in a heartbeat even it were not ☺. and places ¢ as a suffix rather than prefix. Now we know how to do it both ways ☺. I really enjoyed this post and learned something new--"combining several SAS formats while defining another SAS format." Thanks a 1,000,000; I look forward to your next blog post! Great! That was the goal. Thank you for adding to my SAS knowledge. I look forward to reading more.